When its developers originally came up with the idea for Subnautica, they imagined several features for the game that were eventually discarded. One of those was a system for designing and building your own massive submarine vessels. But as the Unknown Worlds development team focused in on what they wanted for Subnautica, the sub-building system was eventually abandoned. In the earliest prototypes of Subnautica, players were able to build expanding submarines out of various in-game units, and then add control surfaces inside that would handle various ship systems. Then, players would work together to steer the craft through the deep-sea waters. The problem? “It wasn’t fun,” said Jonas Bötel, Subnautica’s lead programmer. Bötel gave a presentation on Subnautica and how it evolved over the course of its development at GDC today. The decision to cut the feature was obvious once they had that realization. A more traditional submarine concept worked better, but was still pretty boring, he explained. The submarine only began to feel exciting when the team added systems that made the vessel flood and need repairs as you dived deeper and deeper underwater. Suddenly, it was an exciting gameplay element, one that sparked an emotional response to danger, and they’d done it without using violence – a decision they’d committed to early in development. 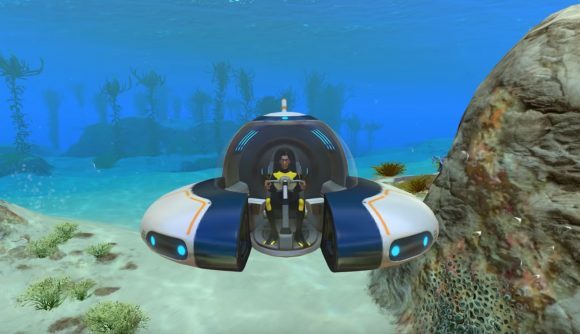 Eventually, Unknown Worlds developed Subnautica’s base-building system, which used many of the team’s initial ideas for sub customization, while the game’s various vehicles were gradually introduced in monthly updates over the course of Early Access. Bötel attributes Subnautica’s success to the open development process Unknown Worlds used, relying on player feedback and community responses as guides to shape the game.